Rich and creamy organic coconut milk from Sri Lanka. Coconut milk is an important ingredient for oriental dishes. 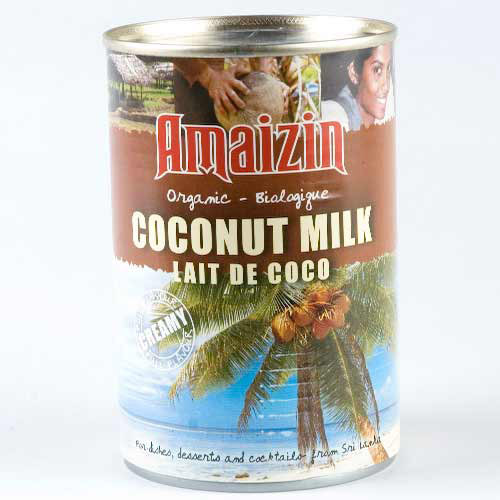 Amaizin coconut milk is very tasty and creamy with a natural emulgator. Try the taste from the East. The Amaizin Rich Coconut Milk 400ml product ethics are indicated below. To learn more about these product ethics and to see related products, follow the links below. There are currently no questions to display about Amaizin Rich Coconut Milk 400ml. Amaizin produce a range of tasty corn chips made from organically grown French corn, and are guaranteed GM free. The corn chips are then produced in Belgium – European production using European corn means less transport, which in turn creates a smaller carbon footprint which is better for the environment.